Some people might argue that having outdoor security camera systems for schools is a waste of the school’s or tax payer’s money, but there are benefits to having these systems. They can provide a level of safety and security, making both children and their parents feel safer about going to school each day. 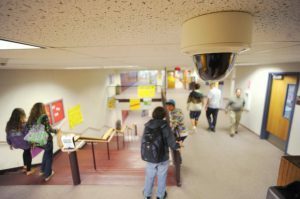 Cameras in educational facilities are great tool to watch out for major crimes, such as school shootings, or to prevent robberies and other crimes, but they can be used in many other beneficial ways. Security cameras can help to keep kids safe as well as keeping schools running smoothly. We install security systems for all NYC public schools, NYC private schools, and NYC Charter schools. Regardless of the area or the age group of the children at a school, there is typically a lot of incoming and outgoing traffic. It is impossible for educators to constantly keep an eye on everyone who enters and leaves the parking lot, but it is important for these professionals to be aware of those who are on school property. By utilizing outdoor security camera systems, school officials can monitor the parking lot from their desks, and they can keep an eye on who visits the facility throughout the day. There are several ways that educators can benefit from watching who enters and exits the school parking lot during the day. First of all, they can watch for unauthorized people who have no business coming to the school; this will allow them to keep the children and the others who are in the school safe. They can also check to make sure that unauthorized people are not picking up children and that children are not leaving school early or coming to school late. There are mischievous children at every age group, and it seems that the need to rebel and misbehave only gets stronger for students in middle and high school age groups. Although it is impossible for educators and school administrators to eliminate this misbehavior entirely, utilizing outdoor security camera systems can help to cut down on the problems that can be caused by these children. For instance, children who attempt to leave the school instead of going to class should be disciplined when necessary. It can be hard for teachers to keep a constant eye on this behavior, but an outdoor security camera system can help. Not only does this help educators and administrators to keep students under control and to enforce rules, but it also helps to protect the students from being harmed in the process of leaving the school. Children who attempt to smoke, drink or use drugs on campus should also be watched carefully. Many parents and educators would be surprised to find out how often this happens at schools at various grade levels, but outdoor security camera systems can help educators monitor for this type of behavior and handle it in the appropriate manner. By using an outdoor security camera system, educators can work together to crack down on misbehavior, bullying, and enforce rules around the school! Having a camera system in your facility will also allow educators to notify parents of any behavior that they might need to know about, allowing them to keep children healthy and safe! Video camera installation services for New York City. Our services include installation and security system design of video surveillance systems, security camera systems upgrades and maintenance and POS recording among other security services. We offer quality DVRs, surveillance cameras and other CCTV Surveillance system equipment. Video Surveillance System – 24/7 Recording & Monitoring With Video Surveillance. Our Security Camera Installations comes with Free Risk Assessment, free Site Survey, free quotes and all installation are guaranteed with one warranty on labor and parts. We are a New York security cameras installation company supporting all types of Business, schools, warehouses, stores, government, and home Surveillance system. Our services currently available in the following states and cities of NY and the surrounding areas: Manhattan, Queens, Brooklyn and Long Island. Feel free to contact us for a free CCTV Installation estimate. we also have a CCTV Surveillance Maintenance Service Plans in these areas. Purchasing and installing a School, Municipal, Day Care, Home or Business surveillance system can be an overwhelming task for someone unfamiliar with the industry. Components of this process include choosing surveillance equipment, setting up recording devices, scheduling timers, and the mechanical aspects of security camera installation. We are the industry leader in School Surveillance NYC. Our NYC Security Camera Installations are backed with our award-winning Alpha guarantee. Contact Alpha Computer Group today for a free evaluation @ (877) 608-8647 today!